Gather the entire family, grab some snacks, bring a blanket and stake out a spot on the Upper Noe athletic field on Saturday, September 23 for our 2nd annual outdoor Movie Night. 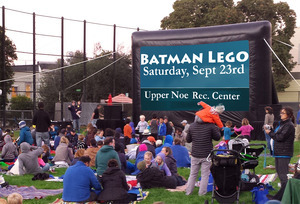 The feature film this year is Batman Lego, an animated comedy/adventure that reaches audiences of every age group. Sutter Health-CPMC 2020 in partnership with the Friends of the Noe Valley Recreation Center is proud to host this free event. Movie time will be 7 p.m. or dusk, whichever comes first, but neighbors are welcome to show up as early as 6:00 p.m. The first 250 families will also receive a goody bag with surprises and treats. For safety and consideration, lawn chairs are discouraged. Alcohol and glass containers are prohibited. It was a fun day of mural painting for local families on Saturday, July 22. 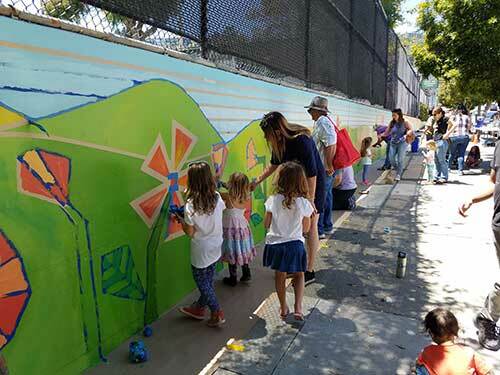 Artists of all ages came to decorate the Day Street wall in a spectacular turnout of community spirit. Led by Little Artistas art school, the 100 foot plus section of blank beige came alive with color in just a few hours. Our thanks go out to Upper Noe Neighbors for initiating and underwriting this lovely addition to our neighborhood. Upper Noe Mural A Picture of Community. UNN will bring residents and merchants new and old together to explore ways to strengthen the vitality of our commercial district. Meet our new business leaders and collaborate on ways to expand business opportunities that support our neighborhood’s common goals. The meeting will include a preliminary introduction to SCORE, a division of the U.S. Small Business Administration that helps businesses succeed and grow with face-to-face mentoring. Wednesday, September 20, 7-9 pm in the Rec Center auditorium. 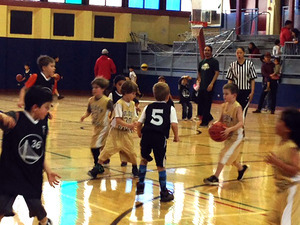 Registration for Jr. Warriors (grades K- 8) and Futsal Indoor Soccer begin October 10 at 10 a.m. Games begin in January. Add classes in advance to your online WishList and register for them all with one click at www.sfreconline.org.